Today we are visiting Tibet for our breakfast combo. Ting-mos are steamed buns, a cousin of the Chinese steamed man-tau buns. These steamed beauties are also available across the border in Sikkim too. Since china and Tibet are neighboring countries, i considered his like visiting he Chinese. I have already tasted Chinese steamed buns like banh bao and huajuan, and so i was sure of the taste and texture of this delicacy. I have used 2/3rd of Whole Wheat flour to make them, then too they came out super soft, spongy and lil springy. The sesame and chilli dipping sauce, complimented the momos so well and all together i was one amazing breakfast. This recipe is part of We Knead to Bake#29, bread baking group lead by +Aparna Balasubramanian . Though i couldn't do it last month, i m happy i m able to do it aleast now. These momos where actually the reason why i m doing his marathon. Yes, i made this combo without knowing it is a combo meal and voila, i got my mojo back. When i can do a combo without realizing it , why not, know it and do it properly!! Thanks to momos, ummaahh!!!! Though it falls a little out of the Alphabet order, i didn't want to leave it out of the Buffet table. So, here it is a delicious and easy to make breakfast bread with a spicy sauce. I used my food processor to knead he dough. he dough can also be hand-kneaded. To make the dough, combine the flour, baking powder, yeast and salt in ino he food processor bowl. Pulse 2-3 times to mix it well. Now slowly, Add water and knead to make a soft and smooth but not sticky dough. I kneaded around 5-8 minutes, since i used whole wheat flour little more than half he quantity. If kneading by hand make sure you knead well for he gluten to develop well. especially, when using more wheat flour. Transfer he dough into another bowl, coat with little oil, cover and set aside for about 45 minutes to an hour until it rises to almost double in size. Now make the filling. mix everything together and keep aside. if you don't prefer raw garlic/ginger in your bread, then you might want to saute it in hot oil for a minute and then mix he coriander with it. 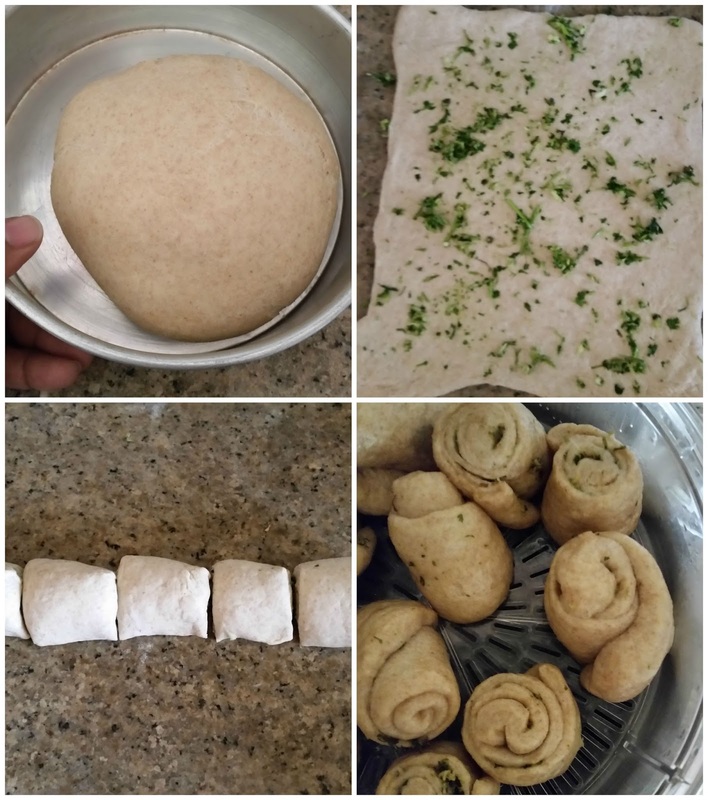 Turn the risen dough onto a lightly floured surface, and divide the dough into two pieces. Roll each piece into a rough rectangle about 5mm thick. scatter half the ginger-garlic-coriander paste across the surface. Roll up the dough tightly, into a log, then cut it into 6 or 7 slices. Repeat the same with the remaining half of the dough. Lightly oil a steamer and place the rolls upright in the steamer (so the cut sides face up/ down) leaving about 2 to 3 inches space in between as they will expand on steaming. I used the steamer that comes with Electric rice cooker, i filled the rice cooker with water and proceeded with the steaming. Loosely cover and let it sit at room temperature for about 15 minutes. In the meanwhile, get the water in your steamer boiling. Steam the Tingmos, for about 15 to 20 minutes until they’re puffy, firm and cooked. Serve warm with Sesame chilli sauce. 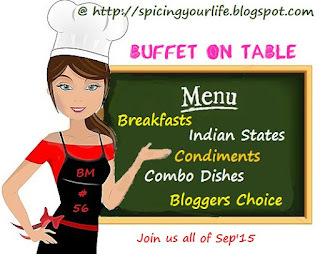 Sending this to Come,join us for breakfast, happening @ +srivalli jetti space. yum yum!!! i am so drooling here!!! love the combo!!! Momos turned out great. So this is the combo you referred to few days ago.. I am glad you got your mojo back with this combo. We would have missed all the wonderful combos you are coming up with. Amazing recipe. I shall have to try this. Am yet to do this incredible steamed bread, seriously i can have few with that lipsmacking dipping sauce. What a lovely bread Priya..looks amazing. Bookmarking and will come back when I need to try it. Interesting Momos , would love to have some.Will try it soon. I remember making this for another BM but I did it in another shape. The momo and the sauce looks so inviting..
First of all, I love the name of this dish :-). Second of all, they look absolutely adorable -- love the shape. Never heard of these and they sound absolutely delicious. Bookmarking. This is the kind that my girls are crazy about. Love it Priya. Keep it coming girl. What a unique recipe nice shape looks amazing..